One of my favorite conferences is the October Conference put on by Dartmouth’s Biomedical Libraries. I went once as an attendee several years ago and this time I went as the opening speaker [I said “Please don’t call it the keynote, that’s pressure!”]. The conference idea is simple: share things that are working for you at your library. It’s a one day affair with ample coffee, snacks and lunch, reasonably priced and wraps up early enough so that you can be home by dinner, no matter where in New England you’re from. Talks are all 30 or 15 minutes and go quickly. None of the topics are “biomedical libraries” in nature, at all. Most of the librarians in attendance are academic, I’m pretty sure. I did a talk on location awareness which was 100% new [I didn’t even repurpose any old crowd-pleaser images] and talked about what’s coming down the pike in terms of mobile stuff — how HTML5 is going to change the idea of “apps” for a lot of people, what some companies and libraries are doing, why people find this fun. 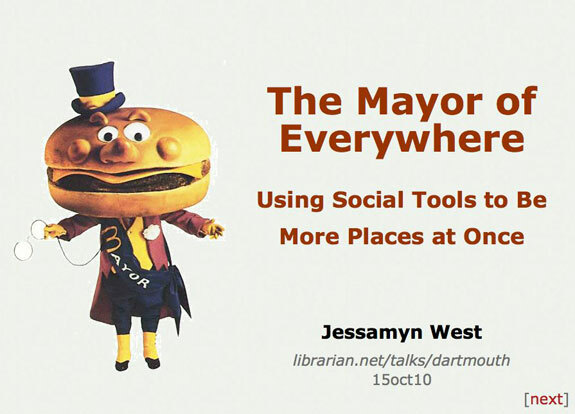 It was called The Mayor of Everywhere Using Social Tools to Be More Places at Once and uses my now-old-timey-seeming HTML slides. Scroll to the end and click “printable” to read the talk as I gave it. It was well-received. You can benefit from this conference even if you weren’t there because everyone’s slides are online in PDF form. Here’s the website for the conference. If you didn’t go this year, you should try to go next year.